Here is a quick battle report of a tourney I attended last weekend. 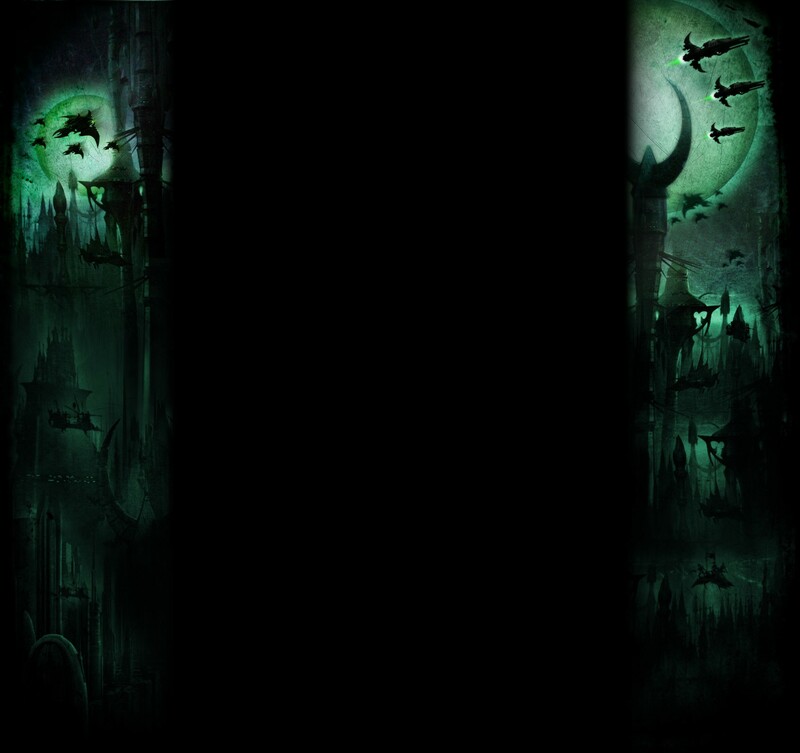 Rules pack - 1500 points, forgeworld models allowed, no major restrictions really (no unbound lists). 5 rounds - mixture of a relic mission, Tac missions in some not in others and kill points in some and not in others. etc. Round 1 - Space wolves with Blood Angel allies. My opponent is a friend of mine I've known for years and it was a pleasure to play against him. His list was really tough - Mainly space wolf characters in a death star unit with terminator armour on wolves with 2 or 3 other wolves attached, containing no less than 24 thunder hammer attacks with the usual +2 armour save and 3+ invul. His allies was a mounted priest to give the unit feel no pain and 5 scouts. He had a flier (assault vech with wings) and a 5 man squad in side. Tight enjoyable game until last turn. ended up 15-5 victory for him. Play another friend of mine in this round with a really tough super unit consisting of a TECH-PRIEST DOMINUS, 1 Cybernetica Datasmith and 4 Kastelan Robots allied with Ezekiel, Chaplain on a bike, 5 other bikes with a banner and 2 5 man tactical marine squads. Plan was to keep away from the super unit and kill everything else. turn one his bikes moved up and shot at my reavers, killing 4 through shooting and a physic shriek, but the reavers with the 2 caltrops survived. A venom and ravager were also wrecked due to his super shooty units split fire, in his first turn! ouch! I countered by assaulting his bikes with my other unit of reavers and the remaining 2 reavers from the first unit, wiping them out consolidating away from the super robot unit in the middle. Some of my remaining venoms took a wound off a robot, but pretty much all were saved or healed up through out the game via various tricks that they have (It will not die, Tech not shooting and auto heal a wound etc. He 5 man tactical squads showed up to score some tactical cards, but then my razorwings showed up and fired 4 missiles into each squad killing them all. The following turn my Void raven showed up and its bomb killed Eziekel! His death star unit carried on killing my venoms and my other ravager but I hide my other units near objectives and kept scoring cards. 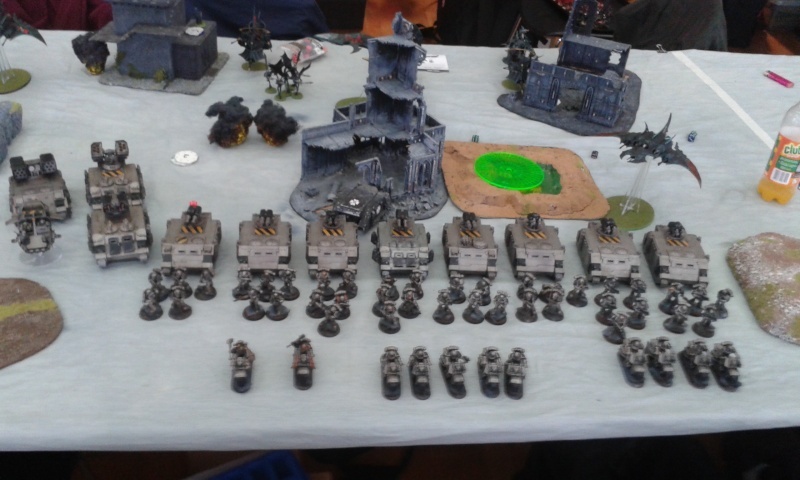 This lists consisted of 2 units of terminators, a captain, a level 2 librarian, 3 units of Tactical marines in drop pods, 3 3man bike squads, a landspeeder and a devastator squad with flakk missiles. 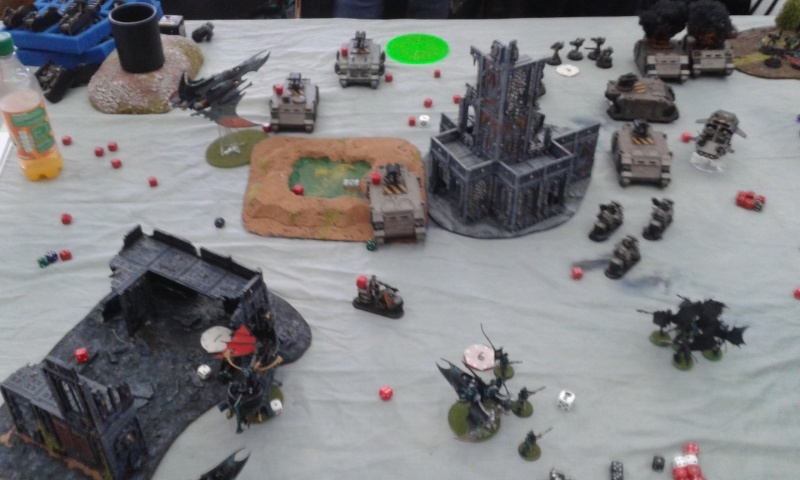 It was a hammer and anvil setup (short table edges) I set up leaving 2 scourge and venom with warlord to deep strike and the 3 flier in reserve. He set up his devastators on a hill in the middle near his table edge and setup some his bikes and his landspeeder as far up the board as possible then scouts closer still. I won to set up and go first. He seized and all hell broke loose! the 2 terminators units deep struck first turn (some formation rule) as well as 2 drop pods right beside my units in my set up zone firing tons of shots into my reavers, ravagers and my venom with my Lhamaean in it. 1 reaver survived, denying first blood and passed his leadership. a ravager took a hull point. In my turn I backed off away from his units and shot them dark lancing the odd terminator and killing a few bikes and marines with poison shots. My reavers (both units) charged his bikes and wiped them out with their caltrops. 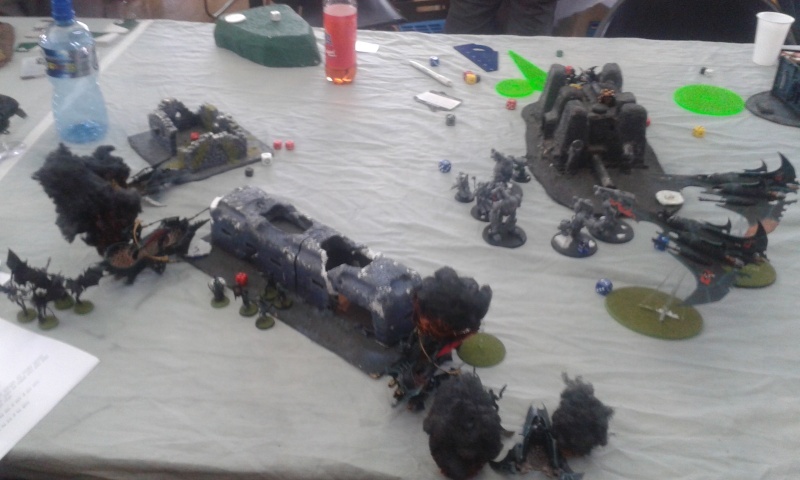 Turn 2 - He shot down my venom with Lhamaean in it On my turn my 1 unit of scourge, a razorwing and the void raven showed up dropped its bomb which only hit one terminator and he made his cover save. I shot my missiles at his devastators killing the flakk armed missile launcher marines and backed further away shooting as I did so. the scourge shot at the landspeed taking a hull point off in the forcing it to jink. My 2 reavers units multi charged 2 of his bike squads killing 5 of them with caltrops. My solo reaver got killed and I hit and ran out of the combat. 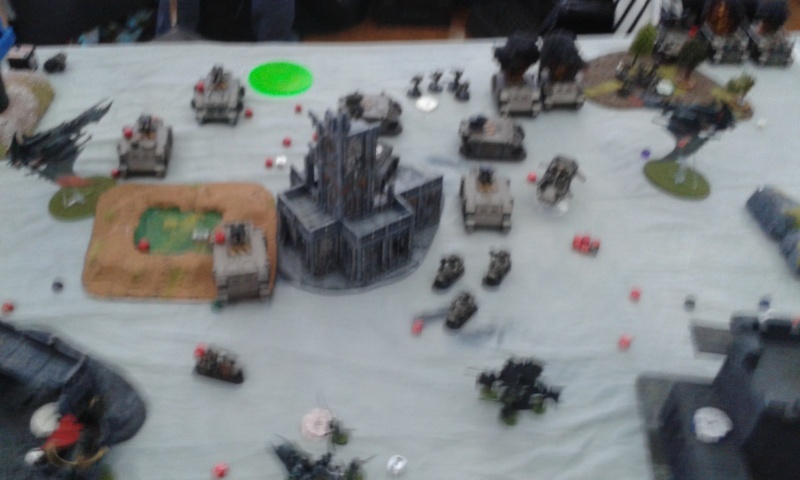 turn 3 - scourge going shot up and wiped out by terminators, landspeeder and the remains of the Devastator squad. His other drop pod landed with his last unit of tactical marines and shot at the reavers who jinked all but one of the hits. 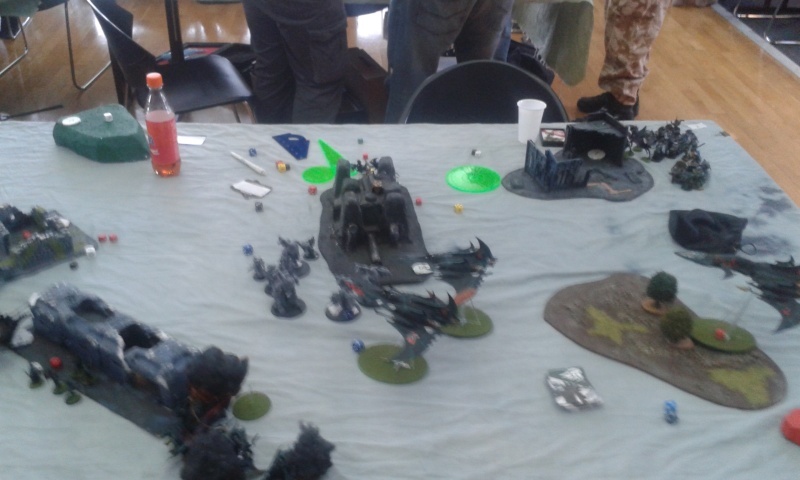 The pod landed close to my venom with the 5 kabalite warriors with a blaster and behind my remaining reaver unit. My Lhamaean charged the newly arrived tactical marine squad and got shot down by overwatch, followed by my reavers who killed 7 of them overall (after shooting, hammer of wrath, CC attacks etc.) My ravagers killed another terminator and took a hull point off one of the drop pods. My second unit of scourge landed right where the other had died and shot the landspeed but fluffed their shots. My other Razorwing arrived wasting all its missiles trying to kill the second terminator squad but they made all their saves. turn 4 - His tactical squad with the captain took down my venom with the blaster. his last bike hid behind a castle in the middle. His terminators killed all but one of the scourge who was killed off by the last of the devastator squad. I my turn the fliers finished off the devastator squad with lance shots. My venom with warlord showed up and killed the bike hiding behind the castle. My ravagers killed his squad of terminators with the librarian. My last 2 reavers killed 2 more marines in his turn of combat and lost some reavers in return and hit and ran out and in my turn charged his landspeeder wrecking it. The last marine was shot by the kabalite warrior unit with the blaster. turn 5 - I messed up this turn, I gambled on the game not ending on turn 5 when I didn't have too. I flew off one flier and moved my warlords venom off an objective for a few extra shot at his terminators and killed off my reavers by charging them at the terminators hoping to rend them to death (the last 2 reavers had caltrops.) My 22 poison shots didn't kill any terminators and my reavers rolled badly for their caltrops, didn't rend any and got killed by the returning powerfist attacks! My ravagers tried to finish off a pod but fluffed it shots. oh and Guess what, the gamble did not pay off, we rolled a 2. game ended 14 - 11 to him (the mission was kill points plus 3 points for each objective plus warlord, first blood and hold the line. no tactical cards used for this game. good enjoyable good but a Silly lose when literally if I turbo boosted the reavers onto an objective, kept the flier on the table and left my warlord where he was I would have won 18-14! There was a lot of units in this army 8 razor backs (2 lascannons, 2 assault cannons and 4 heavy bolters) Squadron of 3 whirlwinds and a landspeeder. 2 units of bikes as fast attack as well (5 models in one and 4 models in the other.) 6 squads of 5 marines and 2 devastators squads of 5 in each squad with no heavy weapons. There was a Chaplin on a bike and a grand/chapter master (4 wounds!) with a +2 save +3 invulnerable save on a bike as well. This was a relic mission which was in the middle of the table and if you got it off the table the game ended. It was worth 5 points and the other 5 objectives were worth 2 points each. This was a really enjoyable game and my opponent was a really nice guy. 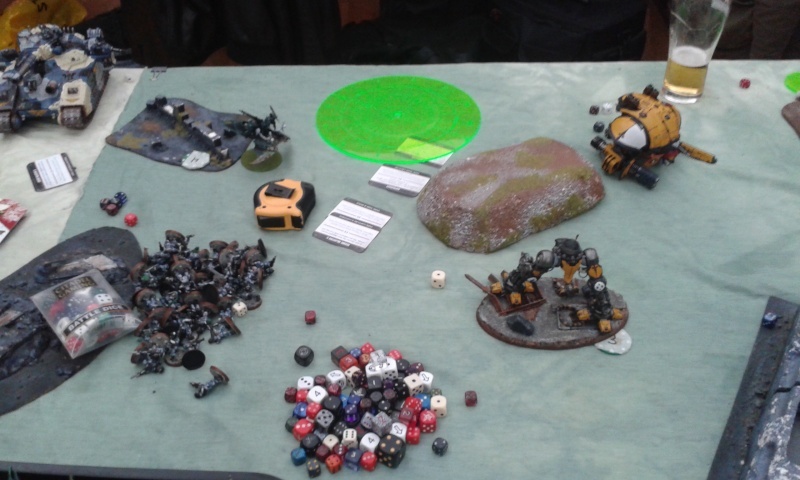 It was dawn of war deployment and I set up across the table behind cover as much as possible. I started with my one squad of reavers, a ravager and a venom shooting at some bikes and the razorback with the lascannon on it. everything missed or failed to wound. I laughed said my opponent dice were terrible and started to use mine instead, first shot with my other ravager 3 hits and explodes the razorback with the other lascannon on my right hand of his deployment zone. One of other venom kills a bike from the 4 man squad of bikes. My other reavers turbo boost other the relic. On his turn, he moves up his bikes with his warlord and Chaplin in it, immobilises a razor back in some terrain takes a hull point of both of my ravagers. Most of his army shoots at the reavers on the relic including the whirlwinds, killing all but one of them. He passed his test. On my turn 2, my razorwings show up, one taking a hull point off the remaining razor back with the lascannon. The other with support from one unit of deep striking scourge wreck 2 other the whirlwinds in the corner and stun the last one, leaving it with 1 hull point left. My ravager on the left took another hull point off the razorback with the lascannon and my ravager on the right destroyed another razorback with assault cannons on it. My lone reaver with the objective pick up the relic in the movement phase, turboed in the shooting phase, then assault moved 6 in the assault phase. My other reaver squad tried to tie up the warlords bike squad, but I rolled badly for double caltrops and only killed 3 and the remainder wiped out all my reavers! On his turn, he wrecked my venom with the Lhamaean and killed all the scourage and immobilised my ravager on the right and took another hull point off the one on the left. His warlord bike squad had only his 3 models left in it (warlord, Chaplin and one marine) moved up to chase after lone reaver with the relic. In his shooting he kills the lone reaver who drops the relic. On my turn 3, my warlord (sybarite) deep strikes in close to the relic and shoots the warlords bike squad, getting 6 wounds, he decides the warlord with take them all with his +2 saves and proceeds to roll 5 1's and 5!!! I nearly fell off my chair with laughter! He remembers that he still has feel no pain and rolls those 5 dice again making 2 of them, surviving with 1 wound due to the fact that he's special kinda space marine captain. Some hull points are taken off a few vehicles little else. After we added everything up it ended up 17-3 victory to me. Oh yeah, void raven never showed up!! Final match of the tourney, I'm facing another guy I know whose been playing 40k for years. His army consists for 50 man infantry unit, 10 man vet. squad, a command squad (5 strong) another 5 man unit can't remember what they were and a Bane Blade and an Imperial Knight. deployment was vanguard strike, scenario had kill points and tactical cards (5 a turn) I picked side, hiding behind blocking terrain as best I can in case he seizes. He doesn't I go first. My 2 scourge units and warlords venom are in deep strike reserve , and my 3 fliers are in reserve. Night fighting I in play. In rolled Labyrinthine Cunning on my second attempt. he got the -1 to my reserve rolls so it kinda evened out. My turn 1, I spread out my 2 venoms and one of the reaver units kill about 10 guys out of the blob. My other reaver squad turbo boosted to score a tactical card over near his baneblade. My ravagers take a hull point off the baneblade. My other reaver unit jumped back behind the block terrain away from his knight. his turn 1, he moved up his blob towards an objective close to my venoms and his knight and baneblade moved around the blocking terrain to get better LOS. His baneblade shot all its guns and my ravagers clipping both immobilising the one closest to the knight and taking a hull point off the other. no other damage was inflicted. On my turn 2, both razorwings showed up, as well as 1 scourge unit. The razorwings shot 8 missiles into the blob of infantry inflicting 44 wounds, killing all but 3 of them as they were out of LOS! The scourge took 2 hull points off the baneblade. The reavers attempted to assault it but inflict no damage. Venom's scored some tactical cards and shot some of the veteran squad. My turn 3, void raven fails to show up as do my other scourge unit. my Warlords venom deep strikes close to his vet squad and command squad in his deployment area. The other venoms move up and shoot the vets again killing 1-2. The warlords venom shoots his command squad killing 2 and they flee off the table. (score warlord) my razorwings fire off its dark lance shots and remove the remaining hull points exploding the baneblade which flips over and just misses the truly blessed last standing scourge!! His turn 3, his knight kills the other in an assault ravager and also shoots the Lhamaean venom down. 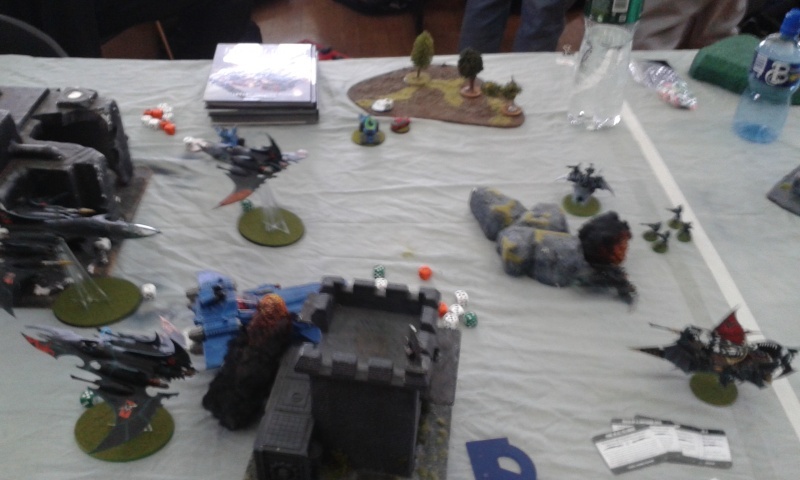 my turn 4, razor wings fly off, still no sign off void raven or other scourge. the vets eventually die to combined venom fire. my reavers kill the last 3 guys from the blob unit hiding behind the hill. his turn 4 his 5 man squad shows up and scores a tactical card near my to surviving reavers. His knight moves to middle of table to score another tactical card and kills Lhamaean in an assault. My turn 5 - razorwings come back on as does void raven (finally!) and 2nd unit of scourge. my reavers turn around and move up to assault my opponents 5 man squad holding an objective. My warlords venom kills the remaining vets my scourge and razorwings kill the Knight before the void raven even shoots!! Reavers assault and kill 5 man squad. opponent gets tabled that turn and ends up being a 19-1 win for me. Another great fun game played with great spirit! props to all my opponents. Much to my disbelief, I ended up finishing 6th (tied on points with the 5th place guy) and got a prize for best painted which may have been an act of charity for playing a pure dark eldar_ list with a void raven, I'm not really sure as I had to rush away at the end. 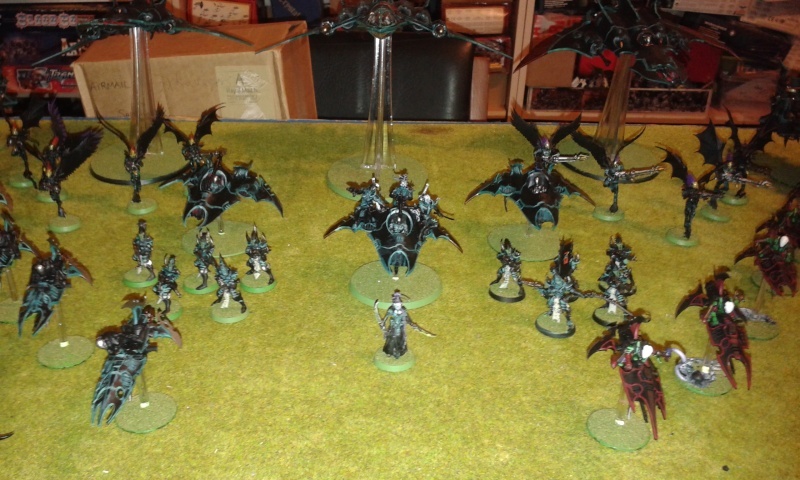 A most enjoyable tournament and my highest finish yet with pure dark eldar_ . probably used the formation then. Its a little foggy, after a late night the previous night. I've always wanted to shoot some razorwings at a guardsman blob. 44 wounds sounds dreamy, and so does a baneblade shooting itself, lol. Great performance for a Pure DE, I'd be proud of that.